Greensboro/Winston-Salem HOA and Condo Management Company Hires Cole as Assistant Community Manager | Company Newsroom of Association Management Group, Inc.
May 23, 2016	(Press Release) - Association Management Group - Greensboro (AMG), one of the Carolinas' largest professional homeowner association managers with five offices in North and South Carolina, recently hired Candace Cole as Assistant Community Manager. Her responsibilities include partnering with current community managers in working with volunteer boards, assisting with contract negotiation and budgeting, helping manage maintenance issues and supporting community communications. "I'm excited about working for a great company where I can put my skills and knowledge to good use. I look forward to learning how to be an effective community manager so I can contribute to the amazing AMG team," she said. To enhance her contribution, Cole plans to pursue the rigorous CMCA credential (Certified Manager of Community Associations) from CAI(Community Associations Institute), the professional and educational organization serving the community association industry. Previous to AMG, Cole performed administrative and customer service duties for the Marine Corps Junior Reserve Officer's Training (MCJROTC) Program Headquarters in Quantico, Virginia. Prior to that, she served as a Marine Corps Training, Education and Outreach Specialist for military members, family members, retired military and Department of Defense civilians, and was responsible for facilitating Franklin Covey courses, providing information about Community Outreach services at public information fairs and delivering exceptional customer service. 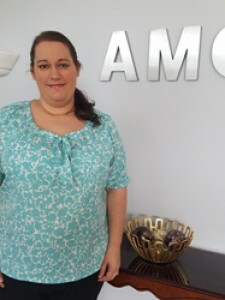 According to AMG President Paul Mengert, Cole brings important skills to the Greensboro office. "Candace is expert at dealing with the public. She's committed to making a difference in people's lives, which is invaluable in our business," he said. "Her extensive knowledge and expertise in delivering world-class customer service will be a big benefit to AMG."